Organizing your pantry before cooking holidays is a small project with a big payoff. The holiday season asks a lot of pantries. You may be baking cookies and pies, serving big meals, or hosting out of town guests. Having expired food, jumbled categories, and stuffed shelves makes the holidays harder. 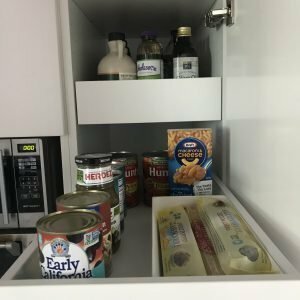 Here are five steps to organize your pantry and make your holidays, and your every day, easier. Table setting items like napkins, placemats, etc. Go through your category sections and get rid of anything you won’t use or eat. You can throw away expired food and recycle containers, and you can donate to your local food bank. Goodwill in Austin takes unopened containers of food and delivers them to the food bank. Put most used items in prime real estate – at eye or chest height closest to the pantry door. Consider the eye height of those who will be using the items. If you have a snack area for younger kids, put it on a lower shelf so it’s at their eye level. Likewise, if you want to keep things out of sight so you’re controlling the environment and not constantly having to watch what your child is getting into, put those items out of sight and out of reach.. Put lightweight and not so often used items on the shelves above your head. Basically, you want things high up that won’t break or break you if they fall down when you’re trying to get them. Put heavy items on bottom shelves or floor. Baking ingredients, cereal, and pasta in plastic lidded containers. 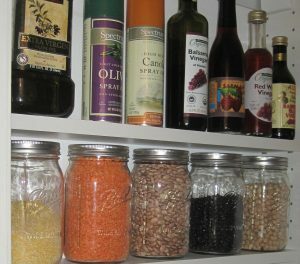 Grains, legumes, and nuts in mason jars or plastic bins. Spices in spice jars organized alphabetically or by category: baking, BBQ, Italian, Mexican, etc. Items that fall off shelves, take up a lot of room, or otherwise need to go together in bins or baskets together. This could be salty snacks, sweet snacks, bags of pasta, pet items, vitamins, or a baking bin. My favorite containers for pantries right now are the Y Weave storage bins at Target. They have lots of sizes, many a perfect depth for standard pantry shelves, and they’re not expensive. Also, they’re plastic so if food spills, they’re easy to clean. I’ve also created a Pinterest board for organizing kitchens and pantries, with a section on products I like. No affiliate links here, just a collection of what I recommend frequently. It may be obvious to you where everything goes, but it’s not always so obvious to everyone in the household. Labeling shelves and/or containers helps everyone. I tell my clients that labels keep us honest. If you’re feeling lazy or an area has gotten overcrowded, you might be tempted to just put things anywhere. Labels are an accountability check for those who know where things go and a map for those who don’t. 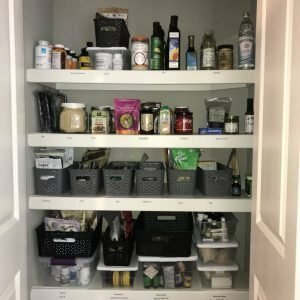 If you need some help organizing your pantry, getting ready for the holidays, or with another project on your list, contact me by email or phone at 512-591-8129.